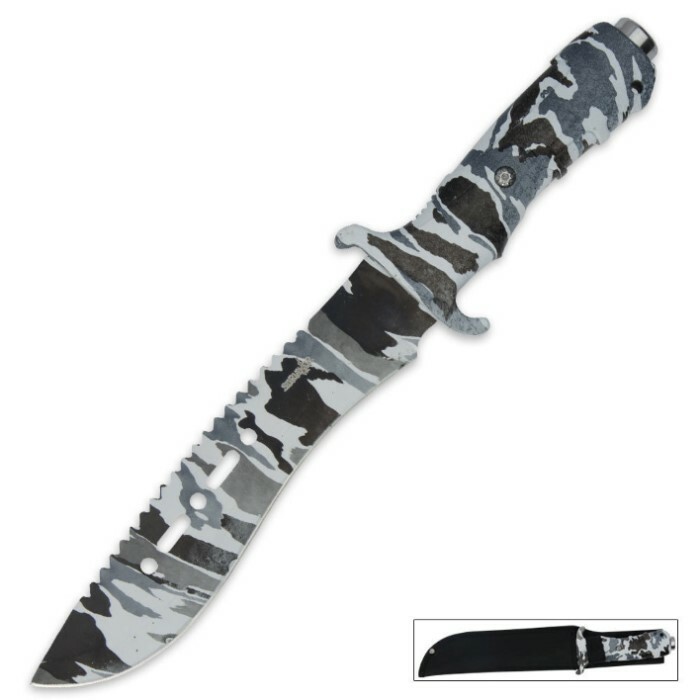 Survival Knife Snow Camo Blade with Nylon Sheath | BUDK.com - Knives & Swords At The Lowest Prices! This fixed blade survival knife is perfect for outdoor activities like fishing, hunting or other recreational activities. I love the way it looks, but it is a lil light and the handle is made for a small hand. not the most comfortable feeling grip. And yes it did come sharp. This blade came sharp out of the box and it still is. It comes in handy when you need it. It gets the job done in little time. It's the sharpest knife on my team even now (8 months later.) My wonderful "Snow Leopard" is like a best friend to me. The paint is coming off, but that's okay with me. I get to make the handle even more bad-**s! NEW ACCOMPLISHMENT: 5 STARS EARNED! I have 1 in snow camo, and 1 in black that I got from another site, and they're great knives. They come sharp out of the box. I haven't put it through any kind of torture test, but it seems like a sturdy knife that will last. The sheath is pretty cheap, but the knife is great. Thanks Budk! I loved the knife it came really sharp and it is very durable.